Orlando Auditing Services - Glickstein Laval Carris, P.A. At Glickstein Laval Carris, our dedicated professionals possess a wide variety of expertise and competence in many industries. We have gained extensive experience in auditing closely held companies, condominium and homeowner associations, not-for-profit organizations, and employee benefit plans. We have undergone a quality review by an independent certified public accountant to meet the standards of the American and Florida Institutes of Certified Public Accountants. Professional representation can be vital during an audit. At Glickstein Laval Carris, we are here to assist our clients in their dealings with the IRS through our experience with tax authorities. If you have been chosen for an audit, the professional representation you can find with us will help relieve some stress. We are here to answer any questions the IRS may be asking of you. Contact Glickstein Laval Carris, P.A. 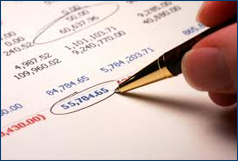 today to schedule an appointment with one of our experienced Orlando Auditing Professionals to discuss your current and future accounting options. Please call us today at 407-645-4775 or fill out the contact form on this page to send us a message.